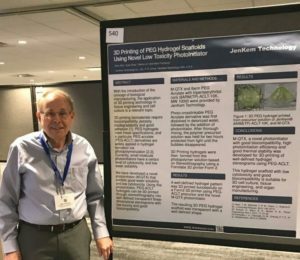 3D Printing of PEG Hydrogel Scaffolds Using Novel Low Toxicity Photoinitiator abstract from JenKem Technology was accepted at the 2018 SFB meeting for presentation in poster #540. With the introduction of the concept of biological manufacturing, the application of 3D printing technology in tissue engineering and cell culture is a relevant topic. 3D printing biomaterials require biocompatibility, porosity, biodegradability and good adhesion. PEG hydrogels meet these specifications, and in particular PEG acrylate (PEG-ACLT) derivatives are widely applied in hydrogel formation via photopolymerization. Currently, small molecule photoinitiators have a certain level of cytotoxicity, and low water solubility. We have developed a novel photoinitiator (M-QTX) that exhibits good water solubility and low cytotoxicity. Using this photoinitiator, PEG-ACLT hydrogels can be 3D printed through stereolithography into well-defined transparent three-dimensional stereograms with low toxicity and good biocompatibility. Please visit our 2018 SFB expo stand #1 for additional information on this exciting novel technology for 3D bioprinting or contact us for details.